This month we will be learning about: Pears, Lettuce, Plums & every child’s favorite… BRUSSEL SPROUTS! We will be reading: The Very Hungry Caterpillar, Lettuce Grows on the Ground, The Fruits We Eat and Vegetables on My Plate. You can cuddle up and read these great books with your child at home too. School Closed 2/18: in honor of our Presidents. Have a great weekend! 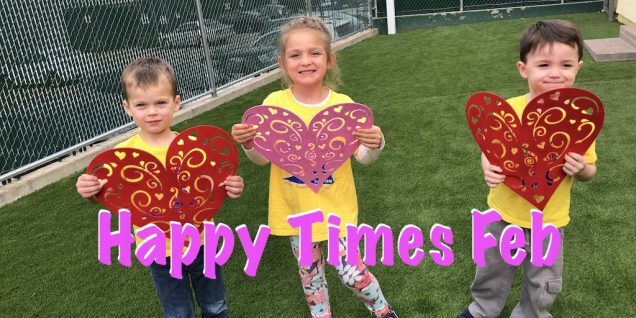 Field Trip: Shadow Ranch Park 2/21 9:30-12:00 Lunch @ school | 22633 Vanowen St, West Hills, CA 91307 | Field trips are available for Busy Bees, Dragonflies, Penguins 3+ years old and potty trained. All children must wear their Halsey Shirt on all field trips. If your child is in the Panda class, he/she may attend the trip if you or your spouse or other loved one join us. Parents are always welcome to attend and space is limited. So let us know if you want to join us right away. Sign up Field Trips here. Staff Development Training 2/26 & 2/27 : Accepting Criticism |Every month our teachers learn something new, takes a look at something old from a new perspective, reinforces and reinvigorates previous education and training, or just have some hands-on fun through our regular training programs. |In addition to our in house training, we receive coaching from Child360 (aka LAUP). Several times a month our Child360 coaches visit and help us improve our parent, children and co-worker interactions. They help us: pinpoint areas to improve, set goals and implement action plans. Learn more about our happy teachers here. Wear it: 3/1 Pajama Day, Dr Seuss Day, Read Across America. In honor of Dr. Seuss’ Birthday it’s National Read Across America day. Come to school in your pajamas all day long! Please have your child wear PJs to school and bring in a favorite Dr. Seuss story to share with the class. All children; Infants, Toddlers & Preschoolers join in on the fun! 2019 – 2020 Enrollment: It’s time to make plans for the next school year. Can you believe it?! Good News! Your child’s space has already been reserved. On February 20, your account will be automatically billed a non-refundable $199 deposit (per family) to confirm the reservation. In September, the non-refundable $199 deposit will be applied toward the Materials and Supplies fee of $199. This fee is used to purchase new supplies & equipment for the children throughout the year. After March 1, we will begin filling spaces with children on our waiting list. New applications will also be accepted if space permits. Space is limited in every class. If your child will not be attending for the upcoming school year, please complete this online form by 2/15. We look forward to celebrating our 40th year with you and your family. Cold & Flu Season: Please make sure to follow our Illness Policy.